What to do around Chiang Mai? How many days to visit Chiang Mai? Would you like to visit Chiang Mai during your stay in Thailand ? The capital of the North of the country, the second largest city after Bangkok , offers many places of interest, including many temples. 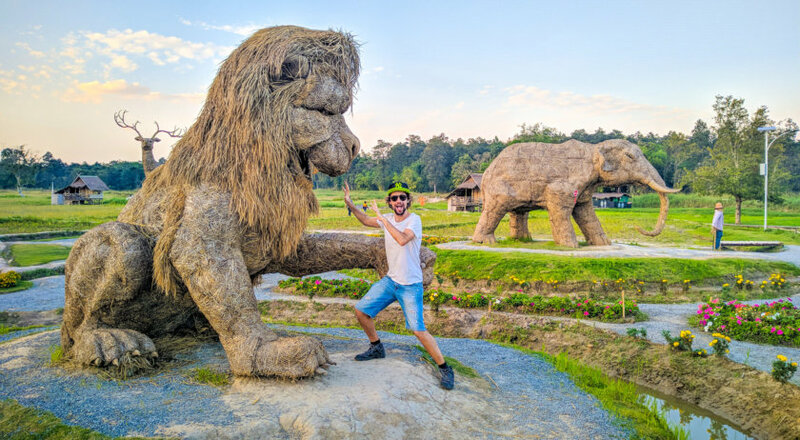 In order to help you organize your trip, I have prepared a complete guide with the 20 best things to do in Chiang Mai. You will also find the most beautiful places to see in the area and my advice to visit Chiang Mai in 1, 2, 3, 4 or 5 days. At the end of the article, I have selected the best accommodation to stay and a tourist map to easily find you in Chiang Mai. So what to do and see in Chiang Mai? Or sleep? 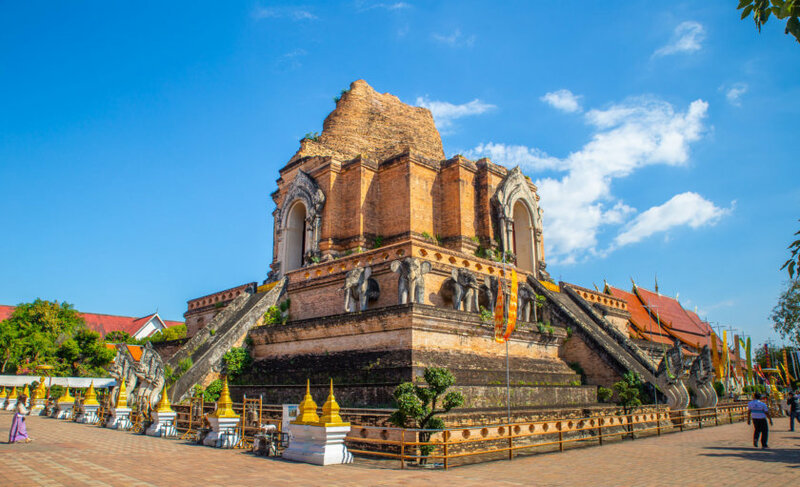 To discover the majority of the attractions and sights of Chiang Mai, it is in the old city that you have to go. It includes a good part of the main temples to visit which I speak to you in detail just after. You will also find markets, museums, many bars and restaurants, as well as all agencies organizing excursions in the area or offering various activities. Bordered by moats and surrounded by a wall, you can enter the old town by 4 main doors located at the 4 cardinal points. You can then walk quietly inside and admire the traditional buildings. As I told you in the introduction, the temples are the must-see tours to do in Chiang Mai. You will find a little bit everywhere inside the old city. Most are free and for those who are paying, the cost is very modest. It would be a shame to deprive ourselves of it! Wat Phra Sing is one of the most famous and most revered by Thais in the city. 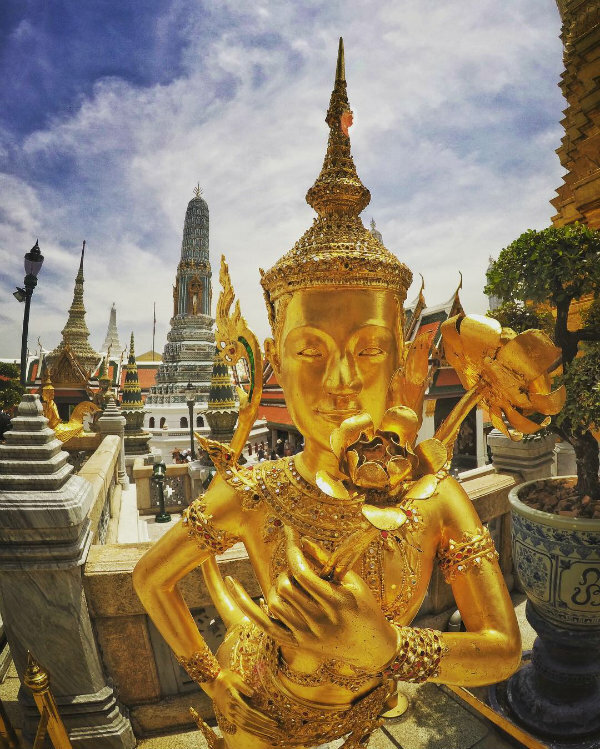 Thousands visit each year to admire the Buddha Phra Sing statue. Free admission. Wat Chedi Luang (40 Baht) was originally home to the famous Emerald Buddha that you can see at the Grand Palace in Bangkok. Although partially destroyed by an earthquake, the temple remains impressive to see. Wat Inthakhin Saduemang, a small teak temple located not far from the monument of 3 kings. Next door, I advise you to visit the temple museum which is well done and free. Wat Chiang Man is the oldest temple erected by the founder of the city in the 13th century. It houses two Buddha statues: one in marble and the other in crystal. Wat Bupparam (20 Bahts ) that I found really super pretty and original. This is one of my favorites in Chiang Mai! Wat Si Suphan, also nicknamed the Silver Temple because built largely with this metal symbolizing purity. To visit the temples , whether in Chiang Mai or anywhere on your Thailand tour , you must have your shoulders and legs covered. So always plan for loose pants or a long skirt to put on before going home. And it’s valid for men too! Located just outside the city , I advise you to visit the Doi Suthep National Park during your stay in Chiang Mai. A road allows you to go around the park in one day and see all the attractions. The most visited place in the park is Wat Phra That Doi Suthep . 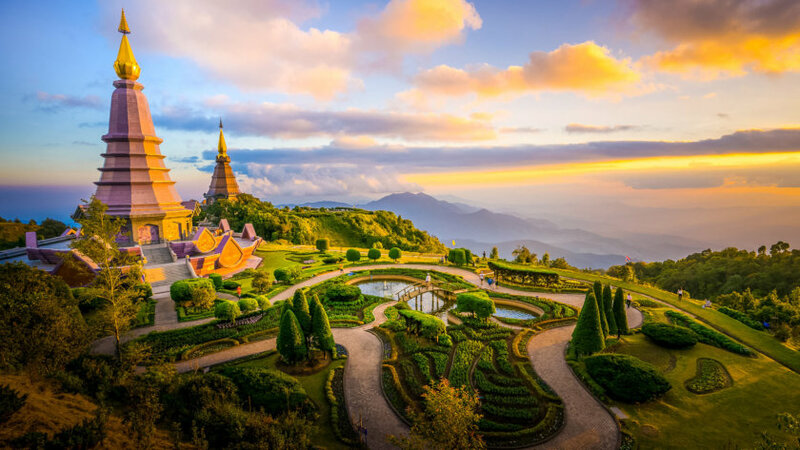 It is at the top of a hill and offers a 360-degree panorama of Chiang Mai and the surrounding area. To reach it, you will have to climb about 300 steps or take a lift (surcharge). But honestly the climb up the stairs is really nothing insurmountable except that it is very hot. But hey, we expect it a bit when we travel to Thailand! Entrance to the temple costs 30 Baht. At the bottom of the temple you will find many souvenir shops and restaurants. The Bhubing Palace (50 Baht) is the winter residence of the Thai royal family when they stay in the North of the country. Only gardens can be visited. They are well maintained and flowery. To see in particular: rose gardens and giant bamboos. Pay attention to schedules because the palace usually closes at 15:30 and must imperatively provide pants to be accepted at the entrance (without holes and not tight!). The dress code is really taken seriously here. The Hmong Doi Pui Village where there is a waterfall and a pleasant garden around (entrance to 10 Baht). In the village itself, you will find almost only souvenir shops. The Mon Tha Than Waterfall (100 Baht + 30 Baht for 1 car): to reach the waterfalls, count 3 km on a narrow road + 5 minutes walk from the car park to reach the first waterfall. You can then take a path on the left and reach another waterfall. This same path then leads to the Sai Yoi Waterfall but it was closed during our stay. Huay Kaew Waterfall: Coming from Chiang Mai, this is the first stop in the park. Only 5 minutes walk to get there from the parking lot. The most convenient way to discover the park is to rent a car or scooter in Chiang Mai . Otherwise, from the city, you can take the red collective taxis (sorng taa or) that will take you from one point to another of the park. Finally, if you do not want to bother with the organization, I advise you to opt for a half-day excursion from Chiang Mai. 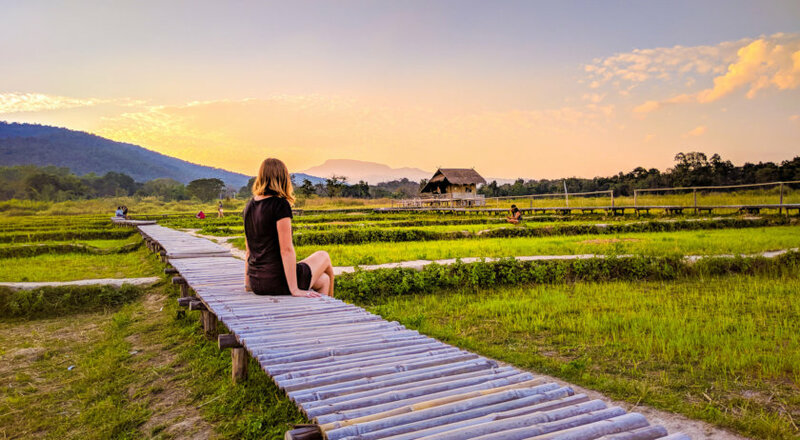 It includes pick up in front of your hotel, transportation by minibus (only 10 seats), a guide and entrance fees to the temple and the Hmong village. This is the best way to visit Doi Suthep National Park if you do not spend too much time in Chiang Mai or do not have a car. This is the must do activity in Chiang Mai to discover Thai gastronomy: take a cooking class! In recent years, the city has become the flagship destination of the North of the country to learn how to cook and many travelers agree a little time during their road trip to Thailand to try it. 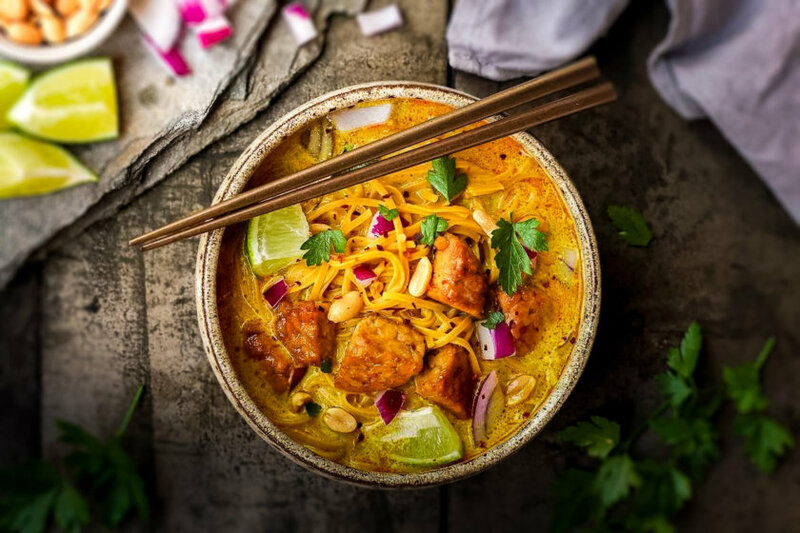 Several schools offer to teach you to make delicious curries, succulent Thai pads and especially the Khao Soy, a specialty of the North: a curry soup with fried noodles and chicken. In general, classes last half a day. We take you shopping at the market to discover the different spices, herbs and vegetables used in the composition of dishes. You will then return to school to cook all that and end up of course to taste your creations! And so you can impress your friends on your return from vacation, you’ll even get a free recipe book. Where to go in Chiang Mai to get out of the city and enjoy some peace? At Huay Tung Tao Lake. 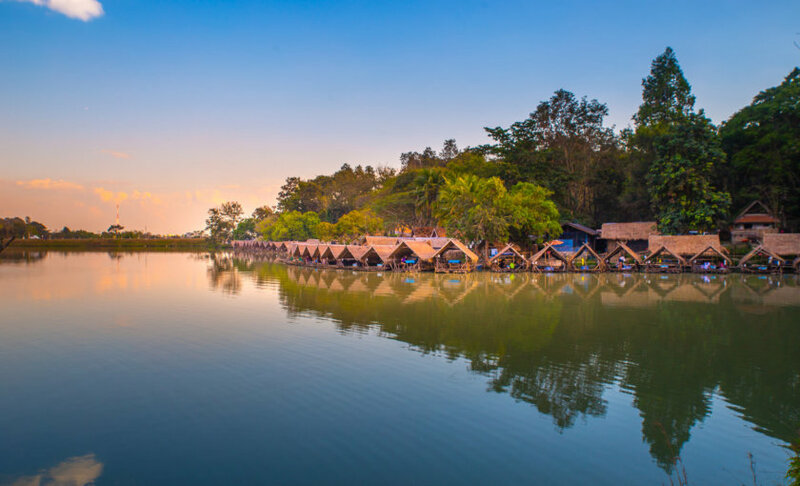 This lake, located about 15 minutes from downtown by car, is the preferred meeting place for Thai on weekends to spend a family moment at the water’s edge. Numerous small wooden huts on the lakeshore allow you to eat fresh fish and spend a relaxing afternoon. You can also go pedal boating or swim in one of the reserved areas. There are also quite a few fishermen. The lake is really big. It is possible to go around by car, scooter or bike. And do not miss to see the large area with giant straw animals representing gorillas, elephants, lions or buffaloes. It’s the perfect place to stop and do some fun photos! Entry to the lake is 50 Baht per person, to pay at the hut before arriving there. 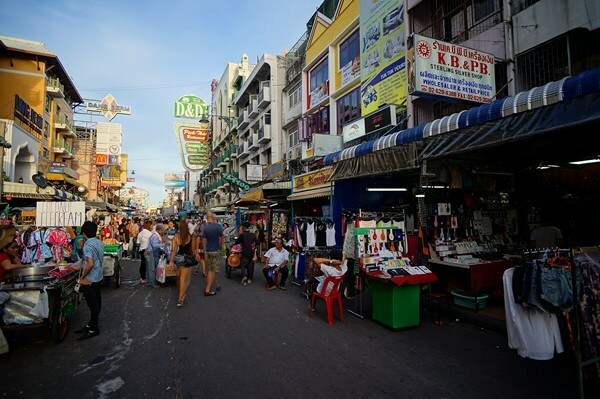 To visit Chiang Mai is also to survey the numerous markets of the city. Whether you’re buying souvenirs or stocking up on fruit or spices, you’re sure to find something you’re looking for. During the day , I advise you to walk the alleys of Talat Warorot market, the largest in the city. There is everything from food stands to clothes. It lies east of the old city and adjoins Chinatown. It is very popular with the local population. Not far from there, also take a walk to the flower market, which is located at the edge of the river. The florists there make splendid compositions for the offerings and garlands of flowers to hang in the cars. In the evening, head for the Night Bazaar (night market) which opens every day from 18 hours. It is located on Chang Klan Road. You will find handicrafts made by the mountain peoples, but tourist market requires, the price is higher than elsewhere. You can also enjoy one of the street food stalls. At the weekend, do not miss out on Saturday or Sunday Night Market. Crafts, souvenirs, clothes, statuettes, there is only the embarrassment of the choice and the prices are quite interesting (cheaper than the market of the weekend of Chatuchak of Bangkok for example). 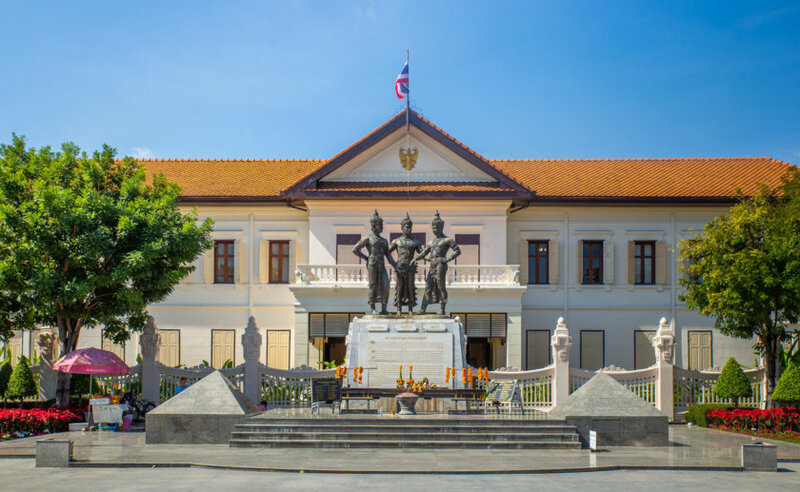 In Chiang Mai, you can also do some cultural tourism by visiting one of the museums. The Art in Paradise museum where you can take a picture of yourself in deceptive 3D decors. This is one of the most visited tourist attractions in Chiang Mai. Really realistic and fun! From Chiang Mai, it is possible to spend a day in an elephant sanctuary. They collect the abused or abandoned elephants and take care of them. You can help the staff to feed them and have them take a bath in the river. Here is no question of getting on their backs! Most of these refuges now respect a certain ethic and try to recreate as much as possible a natural environment. One of the most famous is Elephant Nature Park. It was one of the first parks created to preserve elephants. 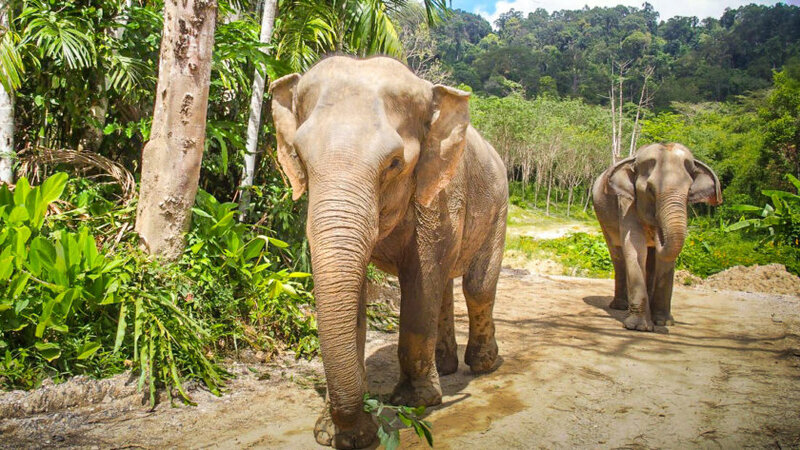 Several agencies offer half-day or full-day packages from Chiang Mai to visit a sanctuary and care for animals. These are all the same, only the location of the sanctuary is different according to the agencies. Prices start in 1800 Baht for 1/2 day and up to 2500 Baht for one day. 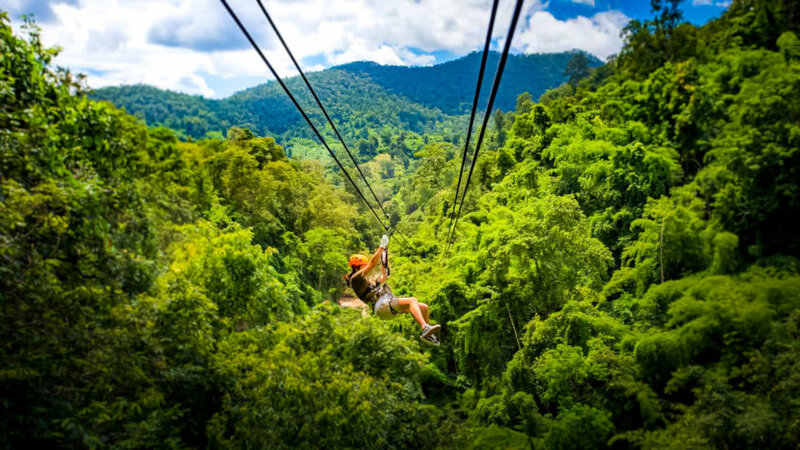 Go zip-lining in Chiang Mai is an excellent activity if you want to combine nature and adventure. 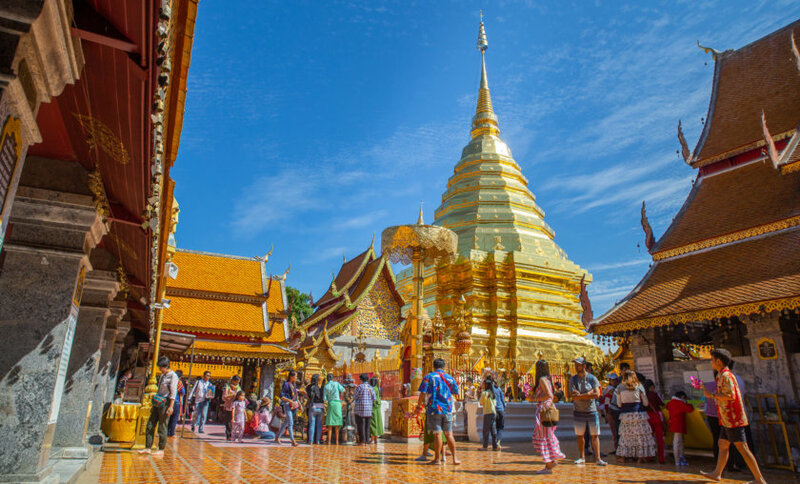 And if you visit Chiang Mai with your family, it will allow your children to let off steam a little and alternate with the visits of temples or cities. I recommend the Flight of the Gibbon Park, which is about 1 hour drive from Chiang Mai. It respects all the conditions of safety (which is not always the case for this kind of activities in Thailand), the guides are super nice and the course of zipline is done in full jungle. You may even have the chance to see gibbons. If you do not have a car, day trips to get there are organized from Chiang Mai. 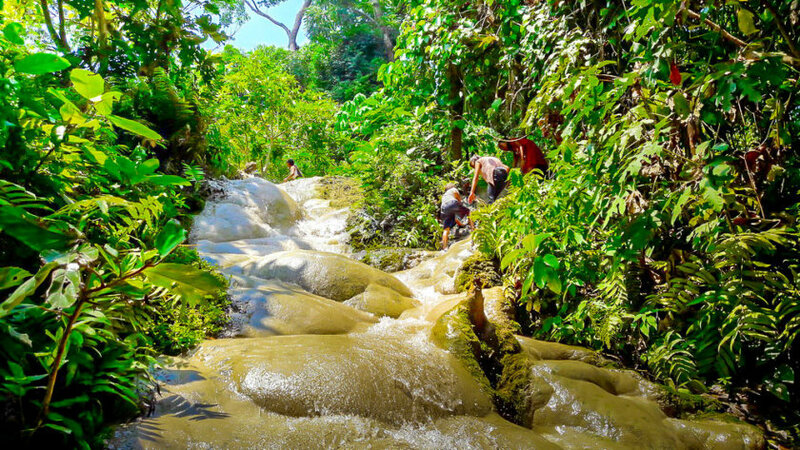 The price includes the pick-up at your hotel, round-trip transportation , the 3-hour park tour , lunch and a walk in the forest to see a waterfall. It’s really cool to do! 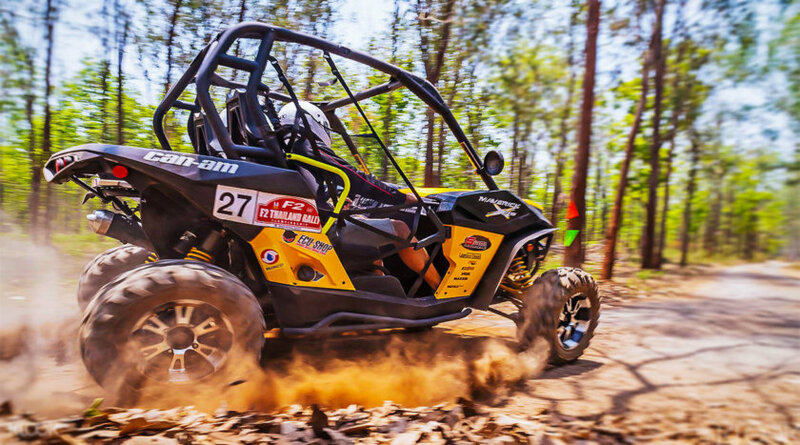 If you have finished visiting the main places of interest in the city and you do not know what to do in Chiang Mai , you can try one of the many sports activities. Mountain biking in the national park of Doi Suthep: 3 tracks allow to traverse it. From 1,650 baht for 4 hours of cycling. Rafting. For a descent of about 10 km, count 3000 Baht per person. Quad in the Thai countryside. From 2,200 Bahts for 3 hours. Kayaking on the Mae Ping River. 1,750 baht for 4 hours. Buggy in the jungle. 1 hour for 2,000 Bahts per person. Most agencies even offer several activities on the same day, such as quad biking and rafting or biking and kayaking . The tours start in the 3,000 Baht, which can be more advantageous than doing 2 separate activities. Do not leave with any agency. Inquire before about its reliability and the safety conditions in which these activities are carried out. Every year, there are many accidents in Thailand due to non-compliance. Chiang Mai is also a known destination where to go for a trek in full nature. You can opt for one or more days of hiking to explore the jungle of Northern Thailand. 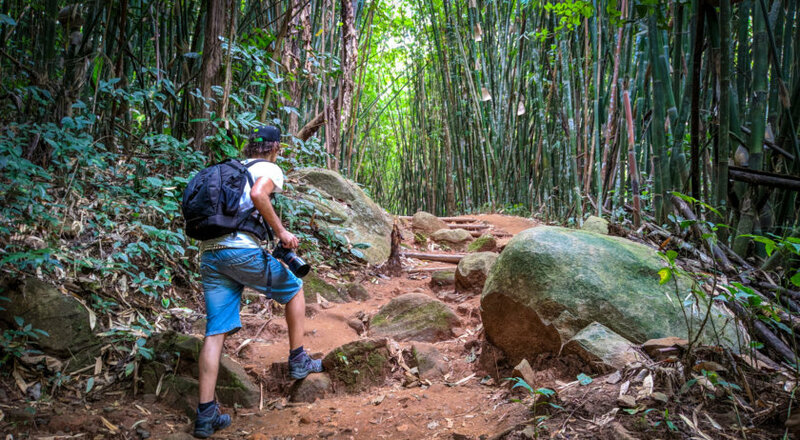 The best areas to hike around Chiang Mai are Chiang Dao, Mae Tang, Mae Wang or the Doi Inthanon. Treks organized by agencies usually include a night in a mountain tribe , Karens, Akha or Lahu, and a bamboo rafting on the river, in addition to hiking. Several also offer a passage through an elephant camp(refuse those who propose to go for a walk on their backs). Fares for a circuit of about 2 days start from 3,500 Bahts per person. The best time to trek on your itinerary in Northern Thailand are the months between November and February. To discover the animals of Thailand, you can visit the Chiang Mai Zoo, the largest in the country. It is at the foot of Doi Suthep, at the exit of the city. During your walk, you will be able to observe more than a hundred species (crocodiles, monkeys, hippopotamuses ..) on nearly 80 hectares. For those who do not wish to walk, a shuttle allows you to browse the site without getting tired. And children will be happy to feed some animals. The zoo also includes special areas such as an aquarium, a snow dome and the Panda House. 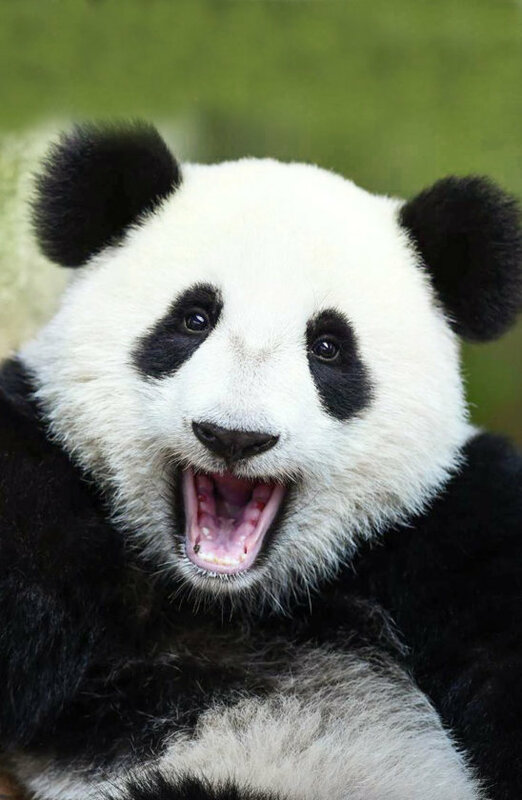 The couple of pandas who live there are besides the stars of the place and among the most popular animals. However, you must pay extra in addition to the entrance of the zoo to visit these 3 attractions. A little flat, however, do not expect anyway to a beautiful park very well maintained as in Europe. The standards are not the same and some areas may seem a little abandoned. And it’s still a zoo, animals do not necessarily have all the space they need. Information for schedules and fares are on the official website. During your holidays in Chiang Mai, it is possible that you have the opportunity to attend one of the festivals taking place in the city. The Songkran takes place every year in April and symbolizes the Thai New Year. And to celebrate, the tradition is to sprinkle everyone with water. All means are good, bottles, bucket, cans, water gun, impossible to cut. And it lasts for a whole week! The Krathong Law or the “Festival of Lights” where thousands of lanterns float in the sky and on the rivers. In November. 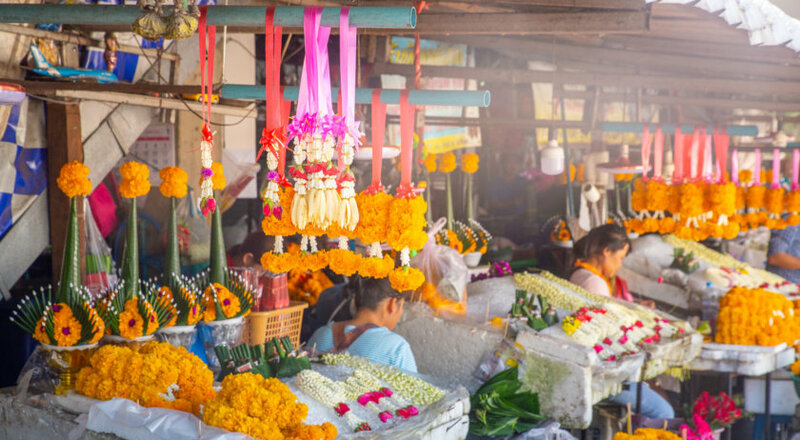 The Chiang Mai Flower Festival takes place every year, the first weekend of February. Dance shows, parades of floats and open-air concerts are organized for the occasion. This activity is becoming increasingly popular in Chiang Mai. The Muay Thai boxing fight is really impressive to see! The combat technique is based on the military training method of Thai soldiers and is now the national sport in Thailand. Even if you are not a fan of violent sports, the experience is worth the detour for the atmosphere of the matches, punctuated by the musicians and demonstrations of fights simulated during the warm-ups. 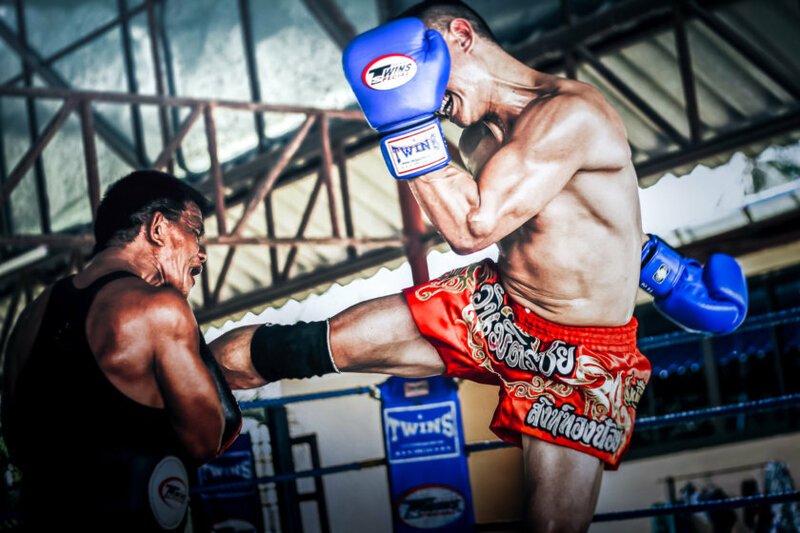 There are 3 places to watch Muay Thai in Chiang Mai: Kalare Stadium, Thapae Boxing Stadium and Loi Kroh Stadium. Entrance between 400 and 600 Baht. Do not hesitate to ask your hotel, they will tell you where the fighting takes place depending on the day of the week. After a long day exploring Chiang Mai , nothing beats a good traditional Thai massage to get back in shape. You will find massage parlors all over the city , around the temples and in the streets of the old town. Most hotels also offer massage sessions, and for some in very beautiful spas. Count on 250 Baht for a one-hour foot massage and 500 Bahts for the body. For the latter, the experience is a bit special because you will be pulled in all directions and you certainly came out a little aching. But do not worry, the benefits will be felt later! If your stay in Chiang Mai last several days and you have toured the attractions I’m talking about in this top, I advise you to go explore the area. 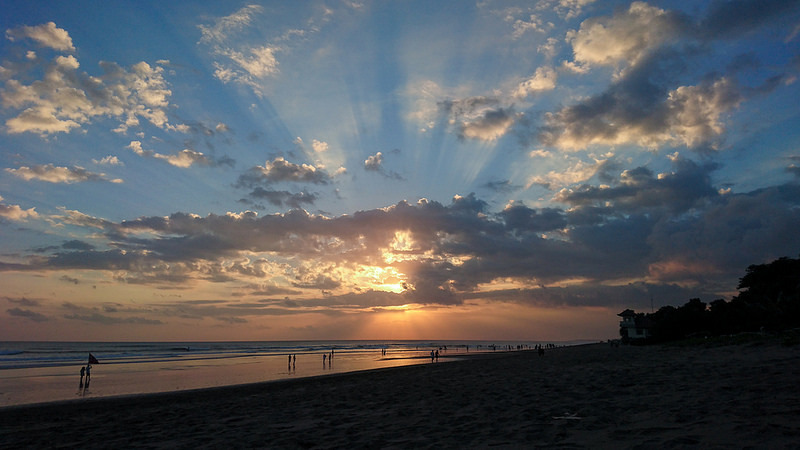 There are several places to see nearby during day trips or mini tours of 2 days. Doi Inthanon National Park is 80 km from Chiang Mai. The Doi Inthanon is the highest peak in Thailand , at 2,565 meters above sea level. You can reach it easily by car and then by a small walk. In the park you can also admire the waterfalls of Nam Tok Mae Klang and Nam Tok Wachirathan. To see also the 2 stupas in honor of the king and the queen, whose terraces allow to contemplate a pretty sight. If you do not have a car to go to Doi Inthanon, the easiest way is to choose a day trip from Chiang Mai. Pick-up at the hotel, transportation, guide, entrance fees and lunch, everything is included! In addition to a good massage, I advise you to go for a ride in one of the hot springs around Chiang Mai. The best known are the hot springs of San Kamphaeng, about 40 km east of Chiang Mai. In a pretty landscaped garden, you can enjoy the pools to soak your feet in water at 40 °. But the most popular activity is boiling eggs where the spring springs, more than 100 °. Small baskets containing 3 eggs are sold at the sources for about 20 Baht. You will see all the Thai people soaking them in the water before eating them! The entrance to the springs costs 100 Baht and you will have to pay an extra 50 Baht if you want to take advantage of the mineral water pool to fully bathe. A nice and nice outing to do around Chiang Mai. If you want to spend some quiet time, prefer an exit to the sources on weekdays. On weekends the site is stormed by Thai families. To go to San Kamphaeng from Chiang Mai, if you do not have a car, take the songthaew (yellow collective taxi) at the Warorot market. The trip lasts 1 hour for 50 Baht. Another natural site idea to go to nearby Chiang Mai is the Bua Thong Waterfall. It is 70 km north of Chiang Mai. 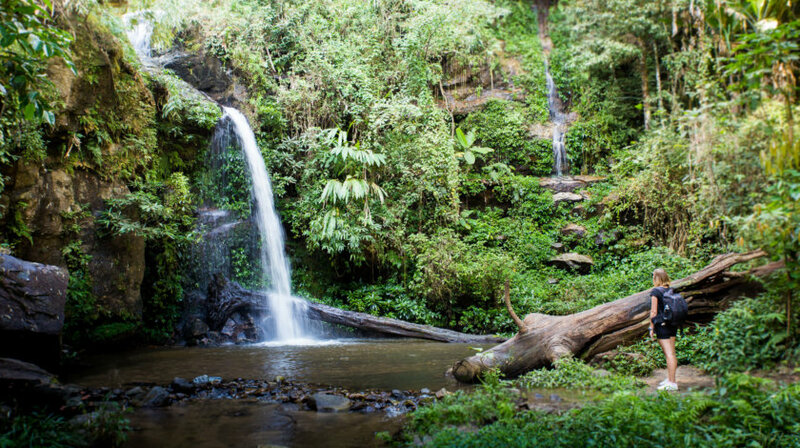 This waterfall is really original , the rock on which flows the water has the particularity of being particularly sticky which allows to climb with bare hands and go up or down on foot. It is also nicknamed the “sticky waterfall” (“sticky waterfall” in French). A system of ropes helps to climb the 3 levels of the waterfall. As much to tell you that if you make a circuit in Chiang Mai with your family, your children will love! And besides the waterfall is not very busy on weekdays , so it’s really nice to do. If you have not rented a car, you can take a public minibus from the Chiang Mai bus station to go there. The minibus will drop you off about 3 km from the waterfall. From Chiang Mai, you can go on a road trip to the province of Mae Hong Son , 145 km away. The landscapes to be covered are splendid and you will find in the area many waterfalls, hot springs and of course temples. The most famous city of the province, Pai is very popular with tourists for its hippie and bohemian atmosphere. She is very lively at night. Last city idea to go around Chiang Mai: Chiang Rai. Well, I admit that it is not so close, because it takes a good 3 hours to travel 200 km separating them. But it would be a shame not to go, if only to see the main tourist attraction of Chiang Rai: the famous white temple (White Temple). It’s certainly one of the most impressive buildings I’ve ever seen on my road trip to Northern Thailand. Even having seen many pictures before, we do not expect that. The fine work, the sculptures everywhere and the white color really form a beautiful set. If you spend a few days in Chiang Mai , you can also visit the Blue Temple, the Black House Museum and the Khun Korn Waterfall. If you are not afraid of the trip, it is possible to visit the white temple from Chiang Mai in one day. You will be picked up at your hotel in a minivan and driven to Chiang Rai where you will visit the temple. A hot spring crossing, a museum tour and a long boat tail tour on the river are also included. It’s a big day, but it’s the best solution if you do not want to drive or have little time. What to do in Chiang Mai with children? A picnic at the water’s edge at Lake Huay Tung Tao without forgetting to take pictures with the giant straw animals! Valid for young and old! Visit Chiang Mai with your family – Your servant gives his person to test the activities! To visit Chiang Mai and its surroundings, I advise you to plan at least 3 days. It is easy to visit the old town on foot in a day but there are so many activities to do next, it would be a shame not to spend a few more days in Chiang Mai to try it! If you have a day to visit Chiang Mai , I advise you to focus on the old city and discover the most famous temples. The discovery of Doi Suthep National Park. 1. Stay in Chiang Mai for a quiet day. You can take a cooking class in the morning, stroll through the city to see Wat Si Suphan for example, visit a museum and finish with a Thai massage. 2. Spend a day in an elephant sanctuary. 3. For the sports version: go zip-lining or another sporting activity such as trekking, quad biking or rafting. Your holidays in Chiang Mai last 4 or 5 days, or even a week? It’s time to discover the surroundings! 5. Treat yourself to a stay in Chiang Rai to visit the White Temple. There are a lot of hotels in Chiang Mai, for all budgets. By cons, the best leave very quickly so remember to book as early as possible! HOSTEL by BED: Hostel located 500 meters from Wat Phra Sing and Sunday Market. Bed in dormitory modern and clean from 10 € per night, breakfast included. The most: the cleanliness of both rooms and common areas, the full breakfast and good, bottles of water at will. It is the best cheap accommodation to stay in Chiang Mai. Ideal for backpackers. Wing Bed: Located in the Old City, 800 meters from Wat Chedi Luang. Comfortable and cozy double room from 35 € per night, breakfast included. Most: brand new, ideal location, excellent hospitality. This is our favorite for its benefit / price ratio in Chiang Mai! Pingviman Hotel: Located 10 minutes from the weekend market and 700 meters from Wat Phra Sing. Thai-style double room with carved wooden furniture, spa bath and balcony, from € 80, breakfast included. Most: swimming pool, traditional decoration, perfect geographical location, comfort. 99 The Heritage Hotel: Located in the pedestrian street of the Sunday night market. Double room with neat decoration and very comfortable bedding from 135 €, breakfast included. What’s more: the pool, the caring staff, the location, the free mini bar and the fruits and cakes available all day. This is our recommendation for an upscale stay in Chiang Mai! 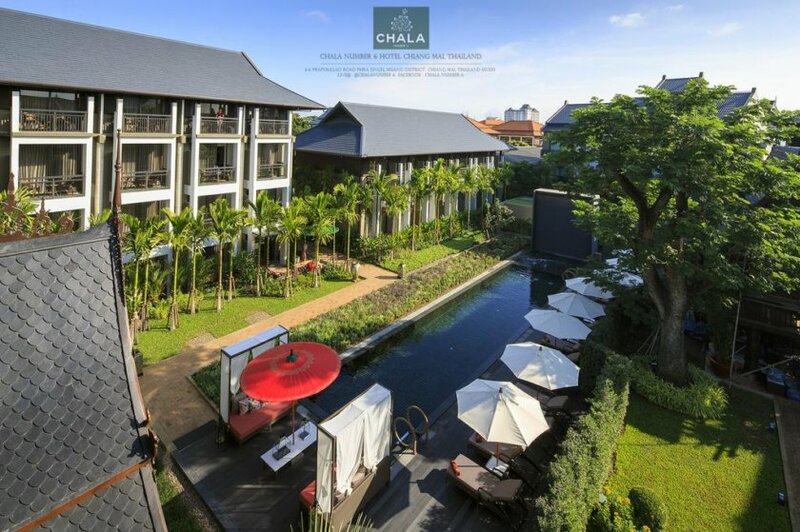 Chala Number6: 5 * hotel located 200 meters from Wat Chedi Luang, in the historical center. This luxury hotel offers spacious and very comfortable rooms from € 190, breakfast included. Most: the pool and garden, the lovely staff, the charm of the hotel, afternoon tea offered daily. This is our recommendation for a luxury stay! I do not really have specific restaurants to recommend to you in Chiang Mai. As everywhere in Thailand, you will be spoiled for choice to eat a good meal! The old town is full of cafes, restaurants and bars . There are food stalls everywhere and you can also go to the market to buy everything you want. Basically, you can eat really anything, at any time of the day and for cheap! Note that the restaurants in the old town are still quite touristy, so a bit more expensive. If you’re really looking for authentic , family-run restaurants , just go out a little from the main streets and you’ll have no trouble finding them. And it will only be better. And if that reassures you, all the food I ate in Chiang Mai was so delicious so enjoy! For dessert, I recommend sticky rice mango, glutinous rice with mango. There too, no difficulty to find, everyone offers it! It should be known that transport is not as developed in Chiang Mai as in Bangkok for example. Here, no subways or public bus network. And taxis are very rare, I did not see any of them during my stay in Chiang Mai. As I said, the best way to visit the old town , is on foot! The song taew, collective taxis, sort of minibus of different colors (red or yellow) according to the places where they go. They circulate everywhere in the city. Just wave them to stop. You tell him where you want to go and the driver will tell you if he is going there or not. Tuk-tuks are very good for short distances but have an unfortunate tendency to try to rip you off the rates! Try to negotiate if you feel the prices are too high and if he does not want to know anything, try the next one. The car is the best way to avoid wasting time and discovering the surroundings of Chiang Mai. The scooter can be a good option to visit the area if you are not afraid of traffic but you will necessarily take longer than driving. Hire a driver for the day if you really do not want to drive. To reach Chiang Mai, you have several possibilities. Chiang Mai has an international airport located about fifteen minutes from the center. The plane is the fastest way to Chiang Mai. There are direct flights from many international destinations. You can also take an internal flight from Bangkok (1 hour flight only!) Or other cities in Thailand such as Phuket or Krabi . The rates are not very high and it’s really a good way to not waste time. Feel free to compare prices for flights to Chiang Mai using our comparison tool in the next section. There is a train station in Chiang Mai that receives trains from Bangkok but also from other neighboring countries such as Laos or Burma. Convenient if you want to make a long road trip in Asia. From Bangkok , the easiest way is to take the night train which takes about 12 hours to reach Chiang Mai. The prices are very low and it is recommended to book in advance because this means of transport is very popular! You can also go to Chiang Mai by bus, from Bangkok for example. The journey time is equivalent to the train (about 12 hours) and the low prices too. Choose a VIP or super VIP bus to get a little more comfort with reclining seats and toilets. And of course, you can quite reach Chiang Mai by car. This is also the solution we chose during our itinerary in Thailand. We made the trip Bangkok – Ayutthaya – Sukhothai – Chiang Mai without any problem. The roads are straight lines to several lanes really well maintained, we have not encountered any difficulty. In addition, the Thai drive very carefully. The other advantage of the car is that it is also very convenient to visit around Chiang Mai. To help you visualize the city a little better, I made you a tourist map of Chiang Mai listing the places to visit I’m talking about in this top 20 things to do in Chiang Mai and the surrounding area. You can display the legend of the map by clicking on the button at the top left with a small arrow. And you, what did you plan to visit during your stay in Chiang Mai? 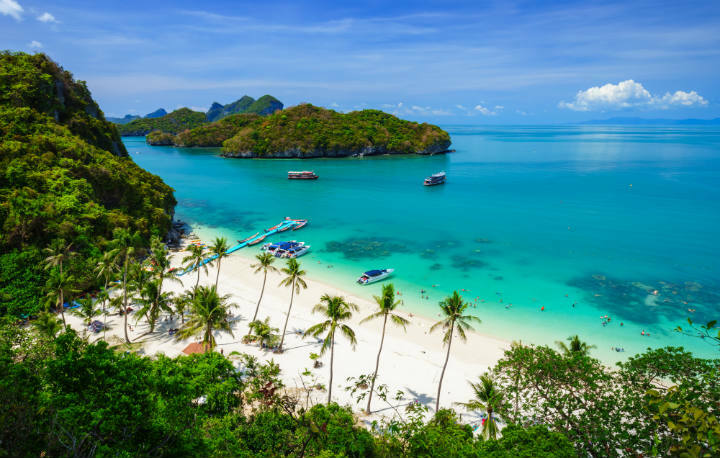 Thailand travel: which island to choose?